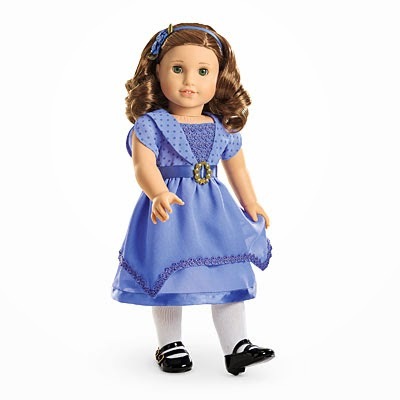 As I mentioned in my brief original BeForever post, American Girl launched their new, revamped Historical doll line (renamed "BeForever") on Thursday. If by some crazy chance you haven't seen what all the fuss is about, you can see all of the new BeForever products on American Girl's website HERE. This set is a little more than I would want to spend on doll food, and I wish the "LOVE" cookies were still separate like the original set, but it's still a fun little set. I want to see this dress in person to see how fragile the material is, but I love the look of it. I think this is one of my favorites of the new minis, but like the others, the stock photo is a bit disappointing. As far as my overall opinion on the change, I have mixed feelings. 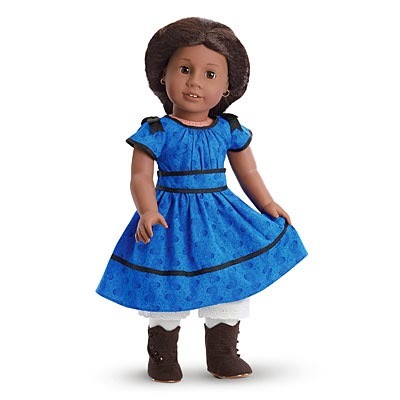 On the one hand, I think it's great that American Girl is working to make the historical line work. There was some speculation that the historical line might be discontinued entirely, especially with the huge popularity of the My AG line and the continued "archiving" of several of the historical dolls. 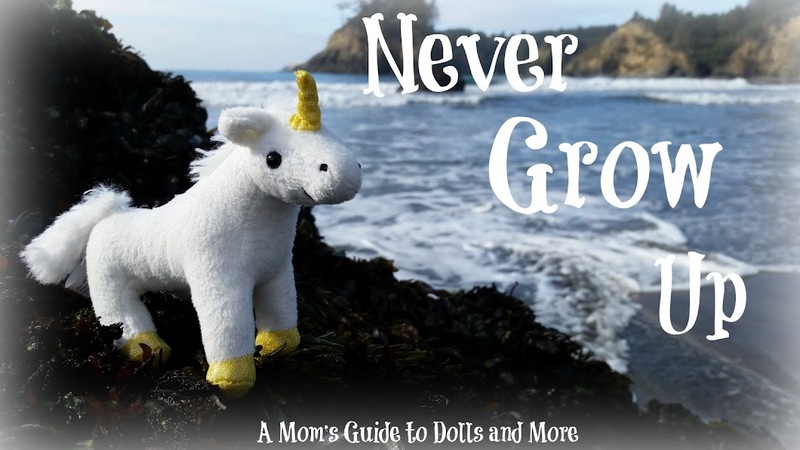 Pleasant Rowland originally started the company with dolls that made history fun and relatable to little girls. I think it would be a shame to lose that original vision. Unfortunately, many of the changes seem to cater more to what will sell and appeal to little girls than to historical accuracy. Some of the fashions, in my mind, seem to be more "inspired by" historical fashions and accessories rather than actually trying to portray them accurately. 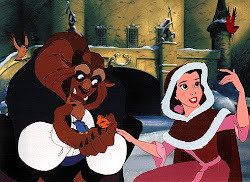 Some of the BeForever colors are a bit too bright or focused on pastelly pink for my taste, and some of the styles (at least in my opinion) seem to be a little lavish for the characters who wear them (especially Kit's and Addy's). 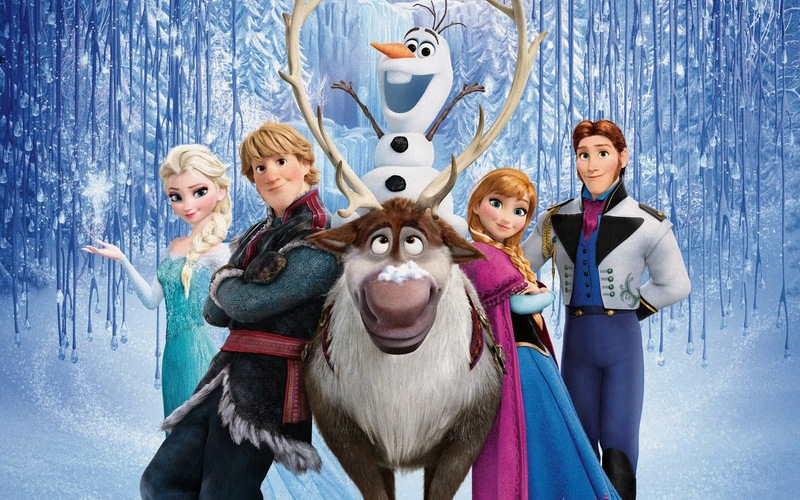 It almost gives the history of the stories a glamorized effect. That being said, I am by no means an expert on historical accuracy in general, and I'm sure there were probably some "creative" interpretations of historical fashion in the original line, too. I also understand that for any company to be successful, marketing is huge, and companies have to go with what is going to sell. -All of the original Meet Outfits and many of the other outfits have been replaced with brand new ones. It appears that a few of the older outfits (not including the Meet Outfits) are still available on the website while supplies last (especially Julie's, Kit's, and Josefina's), but for the most part, they are just gone. Also, for those of you who are not aware, before the BeForever launch, it was announced that AG would no longer be making the best friend dolls (Ruthie and Ivy) or Cecile and Marie-Grace. At this point, there are still some Marie-Grace dolls left, but all of the others are sold out. -For a limited time, some of the new Meet Outfits can be purchased separately. I think this is a really smart move for AG, especially for all of those collectors who already have Historical dolls and just want the new outfits. There has been no word yet on how long the new Meets will be available for purchase. Rebecca's outfit is already on backorder. It also appears that Kaya and Caroline's Meet Outfits are not available for separate purchase. At this point, it looks like only the current dolls are available (so no new mini Molly, Kirsten, Felicity, Elizabeth, Nellie, Ivy, Ruthie, Emily, Cecile, or Marie-Grace). Josefina does not have a mini doll yet, but apparently most of her new things will be coming in the spring with the second wave of BeForever. Also, the older versions of mini Kirsten, mini Felicity, mini Elizabeth, and mini Nellie are still available on the website at the present (you can see them HERE). If you're interested in any of these dolls, I'd grab them quickly, as they are most likely only there until they run out. -Samantha is once again part of the Historical/BeForever lineup (as you probably figured out from the pictures above), but features all new outfits and accessories. None of her old outfits have been re-released (which is a bit disappointing, but understandable). Here's hoping that they bring back some of the other archived dolls! 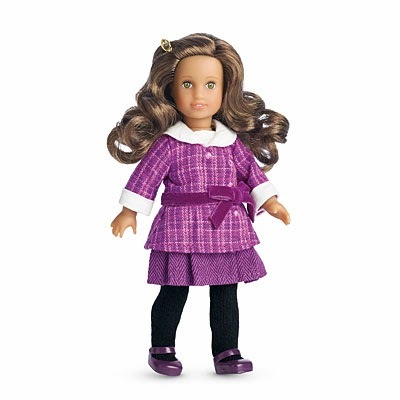 -Each BeForever character line features a coordinating girls' outfit that is "inspired by" the look of the character. I miss the old "dress like your doll" outfits of Pleasant Company days, but those haven't been around for a long time anyway. Also, I think these new outfits could be a good seller because they are outfits that many little girls could wear to school without looking like they're in a costume. Unfortunately, they're all very short (too short to be school legal for my girls) and very expensive. I also always found the "Looking Back" section valuable to learn more about the history of the time period, so I'm disappointed that it is no longer included. -Each BeForever book series includes a third "Journey" book, a "choose your own adventure" story in which a girl from our time period is magically transported back to the time of the AG character. So far, there are Journey books for Samantha, Kit, Julie, Addy, Rebecca, Caroline, and Kaya. Josefina will supposedly get her Journey book in the spring. This is a really great idea, and I hope it takes off. Who wouldn't want to see a modern character interact with her favorite AG Historical? (Sorry, it's going to take me a while to feel like calling them "BeForevers".) ;) My girls, especially Oldest Gal, are super excited about these stories. This is a tough one. There are lots of things that I like about both old and new (pre and post BeForever). Julie Albright's Holiday Dress is ridiculously short, and it's a shame that that cute tank top (from her Meet Outfit) has a peace sign on it since my family doesn't do peace signs. (My dad, Oldest Gal's grandpa, is a Vietnam Vet and is not into peace signs, and we all feel the same way.) Her pants are very cute. Her Tunic Outfit is adorable. I do think that I like the Meet Outfit a little better with BeForever, regardless of the peace sign. Addy Walker's new Meet Outfit is such a delicious blue! Her lunch is very cute. Her new School Outfit, used in the spelling bee, I think I preferred a deeper blue and with the medal. Overall, my favor for Addy and her accessories hasn't changed much. Kaya (no last name) ;) I think I preferred with her hairline lower, but then again I'm not sure. Nothing else much has changed with Kaya, so this will be a very short paragraph. Samantha Parkington's new Meet Dress is adorable. Her dog Jip is kind of goofy with his long hair everywhere. Her Frilly Frock is just darling. The color of the satin reminds me a little of Mommy's high school banquet dress (it almost fits me...and it has a choker, too!!!). Her Bicycling Outfit is cute, but not oh-so-cute. AND THEY MADE HER BICYCLE PINK WHEN THERE IS A SHORT STORY TITLED AND ALL ABOUT HER BLUE BICYCLE, NOT PINK!!! Her Ice Cream Parlor is so elaborate! It's a shame it's three hundred dollars. There I was, wanting the Campus Snack Cart. I think I'll stick with that! Caroline Abbott's Meet Dress hasn't changed at all, so I won't be talking about that. But I think her new Party Dress is OH SO BEAUTIFUL. It looks like a Cinderella dress. Her table, as Grandma told me, basically was copied off from Cecile and Marie-Grace's table. It is "ish" (Oldest Gal's version of "meh"), so it's not exactly on my want list. Josefina Montoya won't be getting most of her new stuff until next spring (bummer), so this paragraph won't be as long as Samantha Parkington's. Her new skirt doesn't bother me much, but for some reason, I think the sash, or buckskin tie, whatever you want to call it, looks better brown. That's pretty much about it. Rebecca Rubin's new Meet Dress is a little bit better (in my mind) than the older one, not including accuracy, according to me, since I don't know anything about that stuff. Her director's chair is adorable, if not cute. Rebecca's Teatime Traditions is, again, kind of "ish". The challah bread is very cute, but that's probably the only part of the set that I would want. That being said, I probably wouldn't use it, especially since I don't have a Rebecca doll. Her Holiday Outfit is... (I've been saving this word) ...BREATHTAKING! It's so me! Kit Kittredge's Meet Dress, I think, has improved. A lot. Kit's Reporter Dress is amazingly "cutiferous", meaning cute. It is definitely one I would like to get. Kit's Photographer Outfit (long name) is cute but then again not quite as cute as her Reporter Dress. Her Typewriter Set is very cute, but not as cute as some other things. Along the lines of mini dolls, books, and dresses for girls, this is the paragraph for those topics. First off, the mini dolls. I saw them online and thought, "Their heads are so skinny!" But then I saw a live picture of them on Flickr (not my account), and they're actually really cute. I think the book covers are great, but I'm disappointed that they don't have pictures inside like the older ones. The Journey Books are really exciting me, but unfortunately, Josefina's book, along with her other main stuff, will be coming next spring. Rats. The dresses for girls are, unfortunately, too short for my family's favor. Caroline's isn't too bad, but they're just so expensive. I was thinking about getting the girls' dress for Caroline on our birthday trip, but that would take up most of my money if I get the same amount as I did for the past two years. First, I'll talk about Samantha. I love her! Because her mini doll isn't bad and her Ice Cream Parlor is JUST ADORABLE! I like the ice cream and everything else about it. And onto the doll, she's cute, and I like her dress, but I'll probably say this about all the dresses for girls, they're too short! Addy is really great, too. 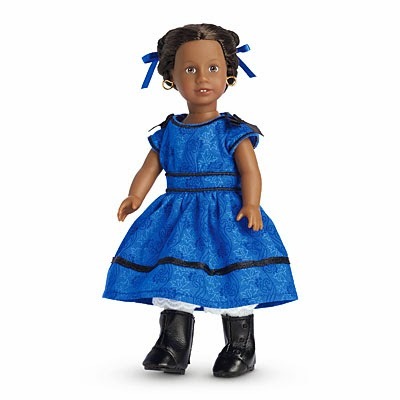 She has a beautiful, blue dress with black ribbons on it, and the mini doll is cute, but her neck looks a little long. 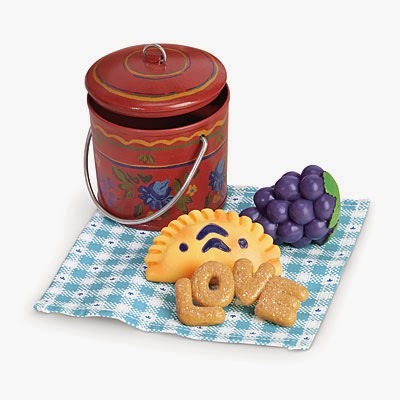 The lunch is really cute, and I like the LOVE cookies, which she made when she was still going to school and learning to read and write. And like I said I would say about all the dresses for girls, it's TOO SHORT! Now Kaya has a bad hairline. I like the old doll a lot better, and the dress for girls is too short and does not look like an Indian dress very much. The tepee is very cute. I like the bedding, and the campfire looks like it's actually lighting up. And I love the material used and I think the tepee material is the same as Kaya's dress material. Now Josefina's only new thing, now it might change sometime, is her dress. It's a little weird but still it's very cute. And as you can probably guess, the dress for girls is just too short! Caroline's Table and Treats are basically copied from Cecile and Marie-Grace's Table and Treats. The mini doll is really cute, but to me, I just like the old dolls better. Now, the girl's outfit has no skirt to be too short, but it has spaghetti straps. But at least it comes with a jacket, so it's kinda good, but, you know, it could get a little annoying in summer. Her Party Dress is, like, kind of a silk-ish material, and it's pretty, and it comes with gloves and blue shoes, and a blue headband that is made out of the same material as the dress. Rebecca's Holiday Outfit is just...adorable! 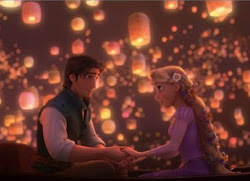 It is very cute and, you know what I like about it? It has no gloves. And gloves would make her look too grown up and fancy. Her Meet Outfit is cute. It has black tights, purple shoes, a purple top hat, and it has a little purse and a purple dress. And this time, the doll's dress is a little too short. And you can probably guess what I'm going to say about the girl's dress, so I won't even say it. I think Rebecca's face is a little skinny in the mini doll, though. Kit's Meet Outfit is really, really cute. And her Reporter Dress is cute too, and her Photographer Outfit is cute, just really cute too! Her Typewriter Set is also, just, cute. My friends have a typewriter, and let me tell ya, that thing is accurate, my friend! The mini doll actually isn't too bad...it's pretty cute. And since I skipped this the last time, the girls' dress is too short. I don't like the Meet Outfit (for Julie) because I haven't mentioned anything with this, because she's the only doll that has this. She has a peace sign, a HUGE peace sign made out of flowers, on her shirt. And the girls' dress has a huge peace sign too, made out of flowers. And on the bottom, there's purple and there's a skirt that's too short, a jean skirt, and there's leggings. Her Tunic Outfit is cute. The clogs are kind of funky looking, though, but I'm not even gonna talk about that because it doesn't really matter. And the flowers on her shirt aren't just boring printing, they're embroidery, which I really think is nice. And it has hot pink jeans. The Egg Chair is pretty cute, and there's like this thing that you can plug into your i-phone, and you can play her music while she's sitting, just sitting in her egg chair. The coat and hat are adorable. They have like this fur, and they're purple...well, I mean, the hat doesn't have fur. And overall, that outfit's pretty cute. So overall, I kinda think this new line is good, and then I think it's gonna go downhill. And it also disappoints me that they're not doing the old historical stuff anymore, isn't that sad? So, I'm half happy and then I'm also sad. I LOOOOOOOVVVEEE Kit's new dress and her new everything! And I just LOOOOOOVVVVEEE the Ice Cream Parlor. And I don't really like Kaya as much because they put back her hair farther back so she doesn't look the same...she doesn't look like herself. And I like Samantha's satin dress, but the thing is it's satin, and satin and Velcro don't go together. And I like the tepee and I like Josefina's oven. And I like Kit's typewriter and her Reporter Dress. And I like the mini dolls but I'm not so happy about the peace sign on Julie's shirt. We don't really do peace signs. And I like Caroline's Party Dress but that's satin too. And I like Caroline's table food. And I like Samantha's new accessories. And I like her new dog. I love the bicycle outfit and the bicycle. The bicycle's just sooooo realistic! And her nightgown's cute too, but still it looks just like any old nightgown, but it still is really cute. And I like the girls' outfit, but it's a little too short, and I'm too young for it. But [Oldest Gal] will probably fit them. And I like her new bedtime accessories. And I like her bed and her coat set and her holiday outfit set. And it comes with a tea set INCLUDING the TREATS!!!! And I like Josefina's new Meet Dress. I like Addy's new mini doll. And I like Addy's new school dress and Lunch. And I like her meet outfit and accessories. I like Rebecca's Holiday Outfit and her Meet Outfit and her Director's Chair. And I like Julie's Egg Chair. I like her winter outfit, Tunic Outfit, and her Holiday Dress. And before BeForever, I liked the car wash and I liked Caroline's old house. And I liked Kit's old Meet Outfit too, but not as much as the new one. And all of the Meet Outfits, but not as much as the new ones! I wish they had Molly still. She's my second favorite. And I like Josefina's Feast Outfit. I LOVE ALL OF THE AMERICAN GIRL DOLLS!!! 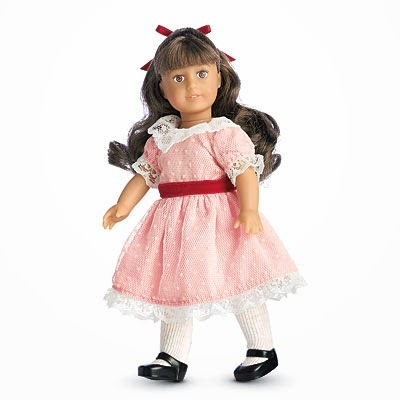 For those of you who would like to compare the Historical items pre-BeForever to the current releases, there's an excellent Historical Doll reference guide on American Girl Playthings' home page HERE. This will link you to Kaya's page. 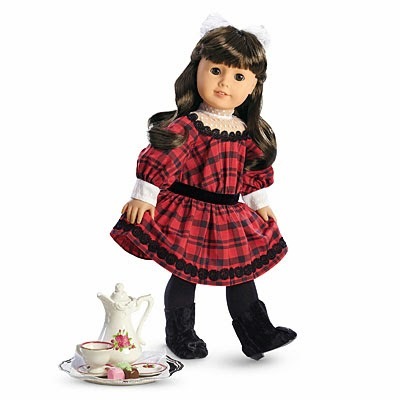 To see any of the other Historical dolls, click on their icons at the top of the page. Hey guys! My BeForever post is close to done, but ended up being a lot more involved than I originally planned. (My girls had a lot more to say on the subject than I expected.) ;) Lord willing, I should have that up sometime tomorrow. 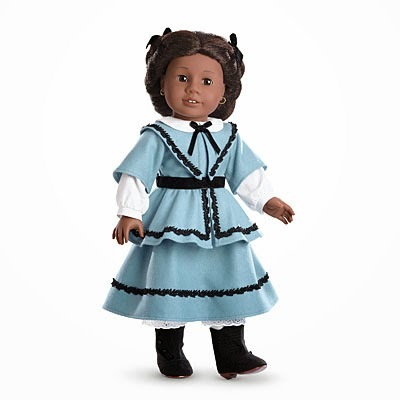 For those of you who don't know already, American Girl launched their re-vamp of their historical line, called "BeForever", last night on their website. I haven't said anything about this new look for the line before this because I wanted to see actual photos before I formed any opinions. I don't have much time now...I've got to get the girls to school and then I meet with my writing friends at the library for a few hours. I plan on sharing my thoughts...and my daughters' thoughts...on BeForever later this afternoon. Until then, here's a link to all the new stuff to tide you over. ;) Talk to all of you soon! There are several different options in the Pop line, from individual ponies, to ponies with accessories (like the set we'll look at today), to sets of two ponies, to ponies with houses. They range in price from around $6 to $20 each. The set we'll look at today cost me $9.99 at Target. One of the features of these ponies which should be fun for some girls is the fact that the ponies can be swapped around and mixed and matched to make new ponies, as demonstrated in the above picture. A picture of everything included in the set. Some basic instructions on the back. A verbal list of all of the contents. The package opens very easily in the back. Everything is nicely held in the clear plastic inside. Here are all of the contents that come in this set. There is a skinny brochure with more info about some of the other Pop sets. I have to say, I totally understand the title of this line since you "pop" the ponies off of the plastic rods and "pop" them together. However, I'm kind of surprised Hasbro got the rights to this name, considering the highly popular Funko Pop line. One side of the brochure. The other side of the brochure. A closer look at my set and the coordinating Pinkie Pie set. Twilight Sparkle and Rarity both come in packs with princesses and accessories. Here's a better look at Pinkie Pie's Sweet Shoppe. Fluttershy comes with a sheet of stickers you can use to decorate her and her picture frames. Here are her tail, mane, and wings. ...and four pop-out picture frames. ...and the birds can sit on the perch inside or the perch on the steps. Time to pop out some of the accessories! I purposely let Middle Gal and Little Gal pop these out on their own (Oldest Gal was still at camp when we did the pics for this review), because I wanted to see how easy it would be for a child in the target age-range to get them out (the Pops are marked at ages four and up). Both girls did okay, but it was not very easy. I had to help Little Gal with some of her butterflies. :} At one point, we thought we might break them trying to get them out! The two pony halves are pretty easy to pop together. I was a bit disappointed to see that the two halves didn't meet seamlessly, though. This was as close as I could get it. I have to admit, the final product was a bit disappointing. I get that they had to come up with a mane and tail design that would work with the removable, swappable aspect of these toys, but it's sad that this was the best they could come up with. It really doesn't look much like Fluttershy. Middle Gal decided that Fluttershy would rather use it to hold one of her pictures. Time for our overall thoughts and ratings! I think the My Little Pony Pops are a great idea, especially for little girls who enjoy changing and customizing their dolls and toys. Fluttershy has a sweet face (especially those cute hearts in her eyes) and fun little accessories. However, I think the design could use some improvement. The pony and accessories were a bit difficult to remove from the plastic rods, even for me as an adult. Some of them felt like they were going to break instead of coming out in one piece. Fluttershy's face doesn't meet completely at the seam. The mane and tail are cute, but as I mentioned before, Fluttershy doesn't look much like herself with the design they used. This particular fact might not be a big deal to others, but it was for me. I was also very disappointed in the quality of the stickers they included. I understand that Hasbro probably wanted to keep them from being too hard to remove since the Pops are being advertised for their ability to be customized over and over again. That being said, the stickers should be able to stay on for more than a few minutes. I think a lot of younger kids will find them frustrating. We also had a problem with her wings falling out when we moved them too much. For these reasons, Fluttershy got a rather low score in the "Pleasing Qualities" category. I still don't regret getting Fluttershy, because she looks cute with the rest of my Fluttershy collection. ;) However, I don't personally plan on adding any more Pop Ponies to our collections. These ponies aren't marketed for posability, so I didn't rate them in this category. The prices are pretty reasonable for all of the pieces and accessories you get. This time around, we'll only hear from Middle Gal and Little Gal. Oldest Gal was at camp at the time of the photos and review, so she didn't get the full effect of popping Fluttershy out and all that. ;) As always, my editorial comments are in parenthesis and italics. All of the opinions expressed are the girls alone without any input from me. Middle Gal (age 8): I don't really like them because their faces from the front look like squares. And Fluttershy looks totally unaccurate (sic). Plus, they're really hard to get out of the plastic rods. Her wings are in just such a way that I can't really see her cutie mark. But otherwise I think they're really cute, like their faces from the side. But it's kinda weird that her mane, tail, and wings have designs on them, and her ears and the tops of her legs have hearts on them. But her wings pop off very easily (negative). So I think that it would be like something that could be fun, but you wouldn't want to take them apart very much because you could lose the pieces. If there was a set with just a pony and everything she needed like her hair and her wings and her horn, I would probably like it. The birds are really cute, especially the purple one. But the butterflies don't do anything. I would recommend this for people who don't care about accuracy, but for those of us who do, these aren't exactly the best toy. Little Gal (age 6): I like how they can mix and match. I don't really like the stickers because they make them (the ponies) look weird. I like her desk and I like how she can get fresh air while she's writing. And that's where she writes her letters to Princess Celestia. And I like the pictures and the birds. And I like the birdcage, but I don't know what the butterflies are for. Neither does Mommy! I wish they would make their hair accurate, but it's still cute. And I LOOOOOOOOVE the face. I like how their legs are "departed" (apart) and they aren't stickin' together like paper and glue. I would recommend it.